With the new wave of diverse restaurants opening in Harlem it seems there is no need to go below 110th Street anymore. All you need is right here. 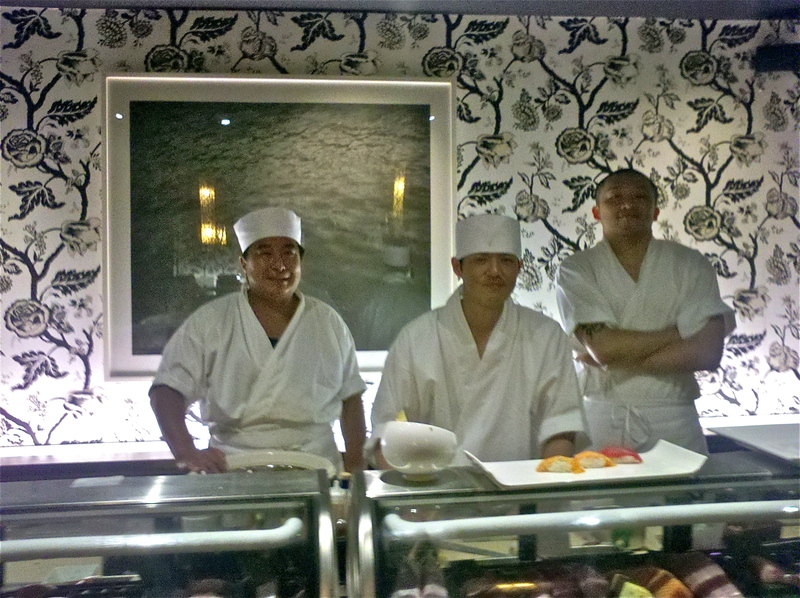 Jado Sushi the latest addition to Harlem’s Restaurant Row is no exception. We posted earlier about Jado’s opening night (see post) and wrote that we have been enthusiastic for it to open since hearing from owner Nobu Otsu last year. Well it was well worth the wait. Last Wednesday night at 7PM when two other bloggers from HarlemCondoLife, a neighborhood friend and myself arrived at Jado it was a full house. We waited at the bar for our reservation and tried a couple of their Delectable Cocktails. I recommend the Gin Cuke, the Ginger Whiskey or for a vodka drink with fresh berries on the sweeter side the Kurenai. They also have a Mojito drink. You can see all the choices and their entire future menu here online menu. Nobu greeted us graciously and apologized that there might be a little wait. We really didn’t wait that long for our table considering how long you may have to wait at a trendy downtown restaurant. The place is nicely layed out and as I had mentioned in an earlier post the decor is elegant and sophisticated. However, it is not stuffy at all. My friend said it was tastefully done very much like The Winery which is another business in Harlem that Nobu runs. As you walk in the bar area is to the right and to the left are two and four top tables grouped together. As you continue to walk through in the back there are decorative booths on the right side and a sushi bar that was very crowded on the left. Very smart design and multifunctional without feeling crowded. Each of the four areas inviting in their own way. The dinning experience was everything I had hoped it to be. We ordered a lot of food so I won’t describe everything only the small plates, sushi and main dishes. First of all last Monday, July 9th, was the soft opening and this is Nobu’s sample menu. Their will be more dishes to choose from and more classics after the Grand Opening which will happen in a week or two. When I asked Nobu what he recommended from the sampler menu he said “Everything on this menu is good. They are all my favorite dishes” and after eating there I would have to agree. All the guests at my table joked saying lets come back again tomorrow night. It was that good. We were greeted by Juan at the door who asked us to wait at the bar and that our table would be ready shortly. He was very busy yet polite and pleasant. We waited about 15 minutes at the bar with drinks and commented at how crowded it was. Nobu was extremely friendly and very hands on with the service, refilling water glasses at tables and doing his best to accommodate the crowd. It almost seemed he was surpassed that it was this crowded. He told us it has been busy like this since day one. Of course this is good for any business and people would rather wait a few extra minutes than to sit in an empty restaurant. We were seated at a comfortable booth near the back by the Sushi Bar. We ordered a sample of small plates and sushi. We ordered the soy calamari $6, lettuce Wrap Shrimp $7, Spice Rubbed Ribs $9, Panko Fried Oyster $7 and the Crunchy California Roll $8. They had already run out of the calamari so we switched to the Jado Chicken $6. This turned out to be one of my favorites but honestly everything was good and the combination of flavors together were delicious. I would have preferred to try a bit more sushi but we had big meat eaters at the table. 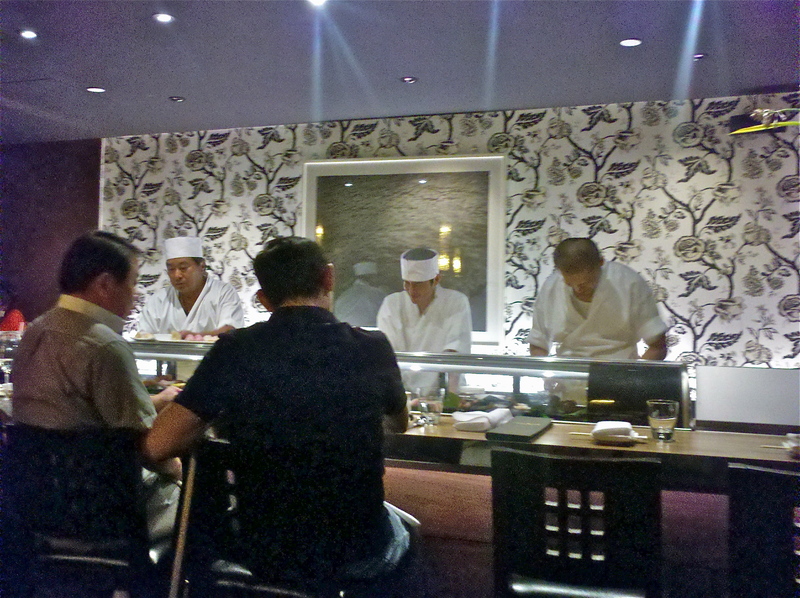 It felt very authentic while dinning and looking over at the active Sushi Bar. I was thinking after a long days work in the future it will be nice to come solo and sit at the sushi bar for a healthy dinner. Very inviting. Back to the food. We then ordered four entrée’s two orders of the Miso Black Cod $18 (delicious!) the Almond Salmon $18 and the Chicken Teriyaki $15. I loved the Chicken Teriyaki and it was a large plate of food. One complaint I had heard through the grapevine was that the portions are small. I felt they were proportionality sized with the price. The only other negative, which turned out not to be a negative, was that my friends Salmon dish she felt was too salty. The waitress sent Nobu over and he replaced it immediately and explained the seasoning might have been over salted. She had the Salmon Sushi and said it was delicious. Nobu was very gracious and hospitable about the situation and my friend was happy. Everything we had here was good. It had a five-star rating on Yelp last week. The Tuna Steak and Braised Pork looked very popular as well though we did not try it. 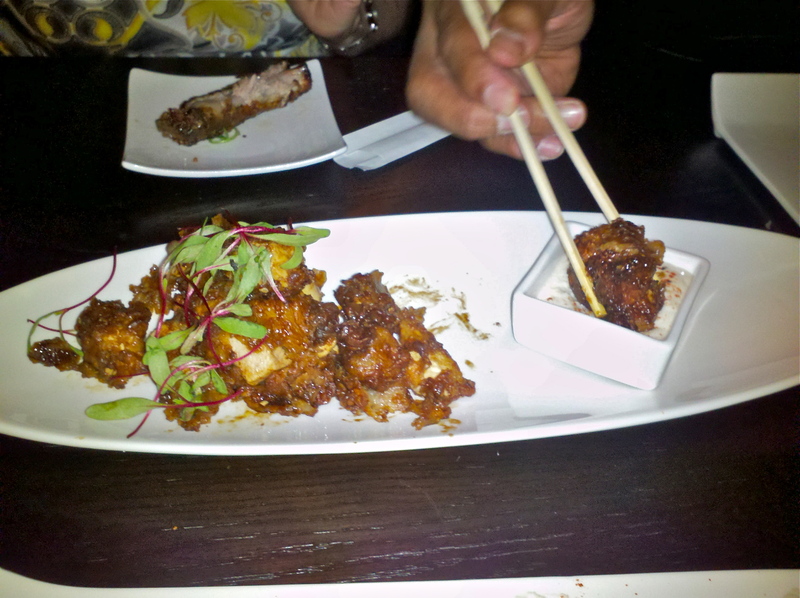 As Nobu had said, he hand-picked all of his favorites for the soft opening menu so you really can’t go wrong here. I went in with two enthusiastic friends and one skeptical friend about sushi and did not know if they would like it. Not only did my friend like it but she has already gone back there with her husband. I thought it was interesting she had mentioned her husband and her had dinner at the recently opened HarlemFoodBar the night before and last night at Jadu Sushi and how great it is to have so many different choices now in Harlem for eating out. With Bier International, Melbas, Les Ambassades, 67 Orange, Chocolat, Amy Ruths, Harlem Tavern, The Five & Diamond, Red Rooster, Corner Social, Zoma, Native Restaurant, Billie’s Black, Lido Italian Restaurant and Bar, Bad Horse Pizza, Cedrics, Harlem Food Bar, The L Lounge, Sylvias just to name a few, you have such a variety in cuisine and could go out every night to a different place and have a great experience. So if you like Sushi or if you are unfamiliar and want to try something different here in Harlem I highly recommend Jado Sushi. Nobu is already running a succesful business here in Harlem on 116th Street The Winery and has learned a thing or two about customer service, quality and what the neighborhood needs. I am happy to see Jado Sushi well received. I experienced nothing but curious people walking in and smiling faces walking out. 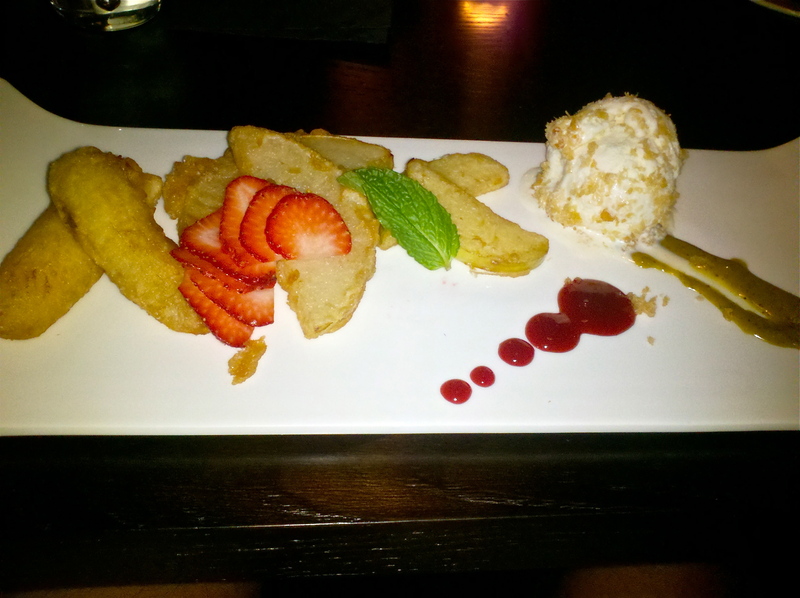 Just one last note you have to try this desert Tempura Ice Cream $7. It was delicious and my newest sweet tooth craving. The official Grand Opening will be in about two weeks. I recommend you make a reservation before you go. Delicious sushi. We had a very good time here the other night I would recommend it. I’d have to agree with Carroll and the majority of comments. 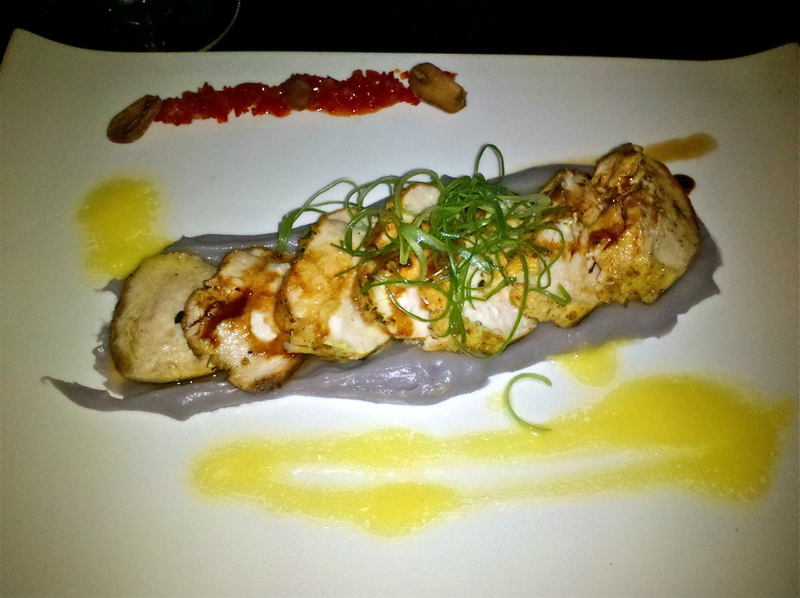 I’ve been to Jado twice and both times the service was very good and the food was fresh and prepared to perfection. I’d give them another chance if you are a sushi lover. And mention something to the manager if you are dissatisfied. They are very accommodating. I’ve eaten dinner here three times now and each time it was excellent. The first time I was there the service was a little slow but it was opening week. The last two times were perfect with service and food on point. I love this place! If your a sushi lover this is not the place to go! The decor was great the service was just ok I’ve had better. The food was not that great starting with the appetizers which we ordered the fried oysters and calamari the oysters were fried hard and dry they tried to put a twist on the calamari all wrong with this soy and garlic to salty and they were warm not hot i don’t think so! Ok we also ordered a glass of Plum wine it was two sips at the most the waiter said its Petite. ya ok. Next we had the Shimp tumpra roll and spicy mango tuna roll very dissapointing the shimp tumpra was cold and not cook to order and the roll just didn’t taste good. What a wonderful review! All the dishes look and from your descriptions sound delectable – I can’t wait to eat at Jado Sushi! I can tell that it will be another favorite in our beloved Harlem! Not to mention the Wine selection. Considering the owner also owns The Winery he has chosen a perfect selection of wines to couple with your dinner. You can get a real good red or white by the glass for $7 to $11. See the online menu above. Beautifully delicious and the food looks delicious! Everything I tried was delicious and the service was great! Love it! Went last night with girlfriends. 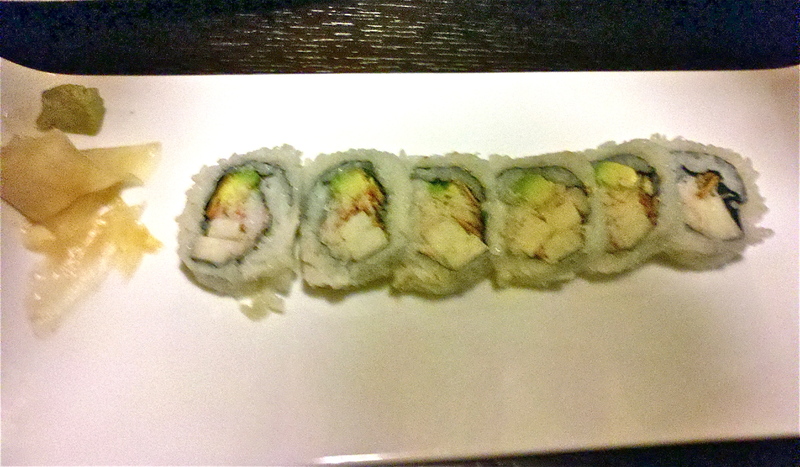 The sushi is fabulous and the owner of the place stopped by our table and is very friendly. I will definitely go back again. It was pretty crowded the other night. The inside looks beautiful. I made a quick stop there last Friday. Sat at the bar and had a couple pieces of sushi and a tuna roll (can’t remember which one). My small sampling of the food bodes well for this place… I thought it was delicious. 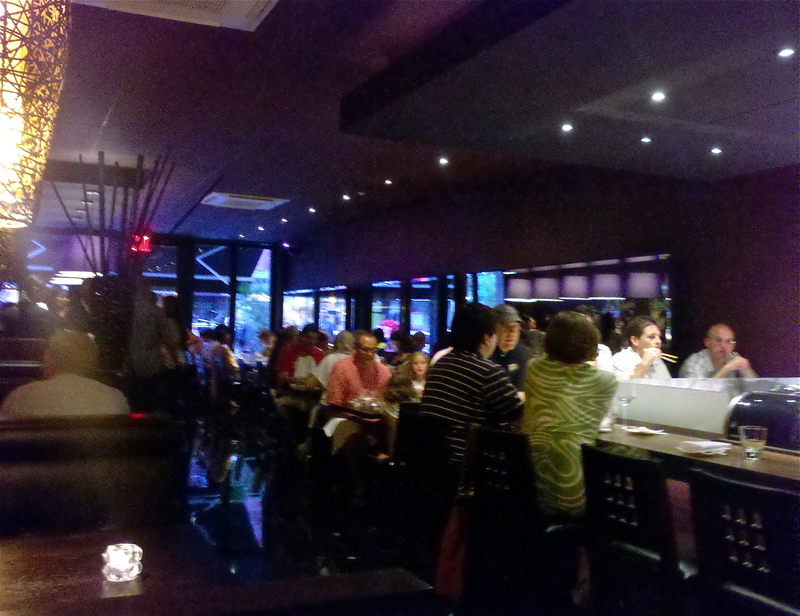 I also really liked the ambience and the layout with one bar in the front, then another sushi bar in the back. From my perspective, Jado is a very welcome addition to the neighborhood!